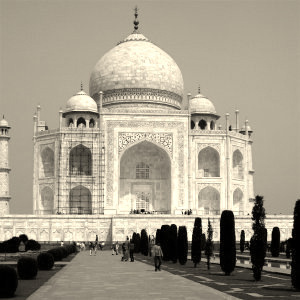 The Sepia filter imitates sepia toning to produce a black-and-white picture with a warm brown-ish tone. Puede encontrar este filtro en Colores → Desaturar → Sepia…. This handle lets you control how much the effect blends into the original image. 0.000 is no effect at all, 1.000 is completely replacing the image with its sepia-toned version. 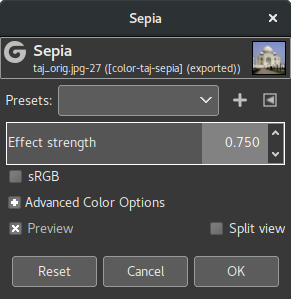 This checkbox allows you processing the image in either sRGB gamma-corrected or linear color space.